Can I Play Loteria Nacional Online? Read Reviews! Days of Draw: Thurs., Sat. Can you imagine a lottery that had its very first drawing occur back in 1812? You don’t have to wonder any more about it because we’re about to present one of the world’s oldest lotteries – Loteria Nacional from Spain. Apart from being the great, great, great grandmother of other lotteries out there, Loteria Nacional has a highly specific game play mode. Buckle up because it’s time to learn about an ancient lottery that is like no other! As already mentioned, the very first drawing of Loteria Nacional took place in the distant 1812. Today, it has become so popular in many parts of the world that the operator has information about players from 140 countries getting their Loteria Nacional tickets. The drawings take place two times per week – on Thursday and Saturday. Additionally, Loteria Nacional has special holiday drawings that feature larger prize pools than the regular ones. What makes Loteria Nacional different from other games is that players don’t really choose their own numbers. Instead, they buy a ticket with pre-printed numbers on it. According to the official presentation, every one in three tickets produces a cash prize – one of the biggest reasons why Loteria Nacional is so huge across the globe. Is Loteria Nacional a Scam? We’ve been instructed to believe that things that seem too good to be true usually are. This isn’t the case with Loteria Nacional. The game is far from a scam because it’s been around for such a long period of time and because it’s organized by a national entity. 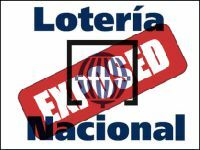 Loteria Nacional is one of the games in the portfolio of Loterias y Apuestas del Estado – a governmental organization that has been operating since 1763. The primary purpose for the establishment of the organization was the generation of funds for social causes through lottery ticket sales. Apart from Loteria Nacional, Loterias y Apuestas del Estado has various other games in its portfolio. A few of the most prominent include Primitiva, Gordo, Bonoloto, Quiniela, Quinigol, Quintuple Plus and EuroMillions for Spain. With all this being said, Loteria Nacional is not a scam. It’s offered through a national entity and the sale of tickets internationally is also guided by regulations to ensure fairness. Since you’re not picking your own numbers, the manner in which Loteria Nacional is played will differ from most lotteries that you’re already familiar with. For a start, you have to choose the drawing that you want to participate in. A single entry in the Thursday drawing costs three euro and if you want to buy a ticket for the Saturday drawing, you’ll have to pay six euro. The specialized drawings usually come with higher ticket prices because they offer a bigger award pool. Each ticket that a player gets is called a tenth share (decimo). Each decimo has five digits printed on it. For every single drawing, a player can get a minimum of one or a maximum of 10 decimos (one billette). The ticket price quoted above is the one for a single decimo. During the drawing, five digits will be chosen and a prize amount will be allocated to those. If you have the respective digits printed on your ticket, you will win the respective award. Loteria Nacional doesn’t come with a jackpot that accumulates with the drawings because a winner will be selected every single time. The biggest prize in the regular Loteria Nacional drawings is 600,000 euro. One such award will be handed out. The second prize is 10,000 euro (2 such will be drawn) and the third one is 300 euros (99 award will be drawn). Loteria Nacional also comes with a number of smaller prizes for every single drawing. There will be 999 120-euro prizes per drawing and 9,999 60-euro prizes. All of the prize tiers and the winning numbers are announced on the Loteria Nacional website immediately after the drawing. Apart from the standard drawings, there are also specialized ones that feature much bigger prize pools. Very often, Spanish families will come together and accumulate some funds to be capable of buying a bigger number of decimos for the special drawing. A special drawing occurs once per month, the three biggest ones taking place in January, July and December. For each of these, there’s a special prize pool that’s a lot higher than the weekly one. The December game is typically the biggest one and the amount that players will be competing for will typically be announced in advance. Players have three months from the date of the drawing in order to claim their prize, regardless of the amount. Starting January 2013, Spain has introduced a tax on the amounts won through lottery games. Prizes of up to 2,500 euro are exempt from taxation. A larger award will be subject to a 20 percent income tax, regardless of the country that the winner comes from. Can You Buy Loteria Nacional Tickets Online? The popularity of Loteria Nacional across the globe has made it possible for international players to acquire their tickets without having to travel to the sunny country (although, if you can organize such a trip, you should definitely go ahead with it!). Some online lottery agents offer ticket buying opportunities for the monthly raffle drawing. This is your chance to test out the bigger jackpots and your luck. Would you mind rating Loteria Nacional? If you’re not troubled by Loteria Nacional’s cons, go ahead and give it a try. There are many prize tiers, some of them featuring excellent sums. Loteria Nacional is a lot of fun for an old lady that’s been around for centuries! I have a feeling I will get very lucky soon! Love the many options this game provides and I think the prices are fair depending on the ticket messenger service which you use.